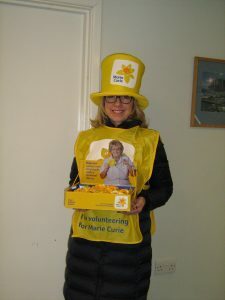 Each year we support the Marie Curie charity by providing them with a base for their Stokesley collection day – All the volunteers call in to our offices to collect their tins/tabards and daffodils. Thank you to everyone who supported us with our fundraiser by baking cakes, donating tombola prizes and giving your time!! 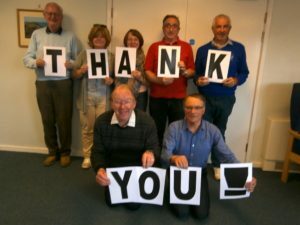 Thanks to Jim (picture above) who on behalf of Barclays Bank will be able to double a portion of the total ….. Thank you to everyone who came along and helped us raise this fantastic amount. by George a Respite Sitter with The Community Care Association. So why am I a volunteer with CCA. Well, I like to think that in helping those who need some free time, then the promise of a sitter for a few hours each week is a great help. I enjoy sitting as I really like meeting new people. You never quite know what you are getting into, and people’s history and backgrounds can be fascinating. It can be a surprise to both the sitter and the person with whom you are sitting that you have common ground. I like to sit as I find it a rewarding experience, as it provides assistance to the relative who is a carer on a full time basis. I find it makes the day of all concerned. The carer gets a break; the person being cared for has a change of face; and it makes me appreciate what I have in my life. INVITATION TO FIND OUT MORE ABOUT VOLUNTEERING WITH SAMARITANS. INFORMATION EVENTS BEING HELD 7PM TUESDAY NOVEMBER 22nd and 29th at Samaritans, Northallerton and The Dales Branch, 7 Crosby Road, (Just behind the Old Prison) Northallerton. DL6 1AA. Access is via the back door in Crosby Road Car Park. Could you touch another persons life when it really matters? Either by discussing their feelings with them directly by phone, email, text, letter or even face to face? Or perhaps you could support our branch by helping with the Administration, Publicity, Fund Raising or Cleaning etc. Our Confidential, 24hr listening service responds to 5 million contacts a year. We also reach out to our local community by visiting schools, colleges, universities, prisons and workplaces. With so much happening we’re constantly looking for new people to strengthen our teams. We usually ask volunteers to give 3 to 4 hours a week, including some overnight time. Out of pocket expenses will be paid to volunteers. Please do come along to one of our Information events lasting 60 to 90 minutes. A Blog by one of our student volunteers …. I have been a volunteer for Chairaerobics for about a year now. Chairaerobics is a gentle exercise class which accommodates people with a variety of conditions or the elderly community. The exercise within the class is gentle therefore many people have the ability to carry out the majority of the moves. However, although being gentle the exercises are extremely affective and can be extremely helpful with a range of conditions such as arthritis. The music ranges from upbeat to calm and relaxing. Jan; the leader of the class knows exactly what she is doing as she was previously a PE teacher therefore has knowledge on the specific muscles and what each particular exercise is targeting. 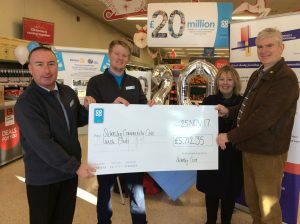 I began volunteering in order to contribute towards my local community, I had heard of Stokesley Community Care volunteer programme through other volunteers within my sixth form (Stokesley). I find it amazing just how rewarding these classes are for not only the members of the class but immensely and unexpectedly so for me as a volunteer. I thoroughly enjoy each session and have had the chance to communicate and build what I would call friendships with each member of the class along with its incredible teacher, Jan. I look forward to each session as it gives me a chance to communicate with people who without this volunteering, I wouldn’t otherwise have the opportunity to meet. Another enormously rewarding factor is physically being able to see how much each and every member of Chairaerobics enjoys the class. I can honestly say it is amazing how much difference one hour a week makes; everyone is friendly and extremely welcoming to any newcomers. The class is held each Thursday morning for an hour from 10:30am in Stokesley Town Hall. Any new members/volunteers looking to join our Chairaerobics family would be very welcome. Volunteering is where you spend time doing something that aims to benefit groups or individuals. You can volunteer whenever you want – morning, afternoon or evenings depending on what works best for you. You can also volunteer as little or as much as you like. Benefiting the community that you live in is a great reason to volunteer. However, volunteering can also benefit you! How can volunteering help me? What type of volunteering can I do? We have hundreds of opportunities and will aim to find you something that relates to a career choice or hobby. 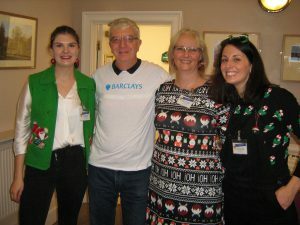 David Smith is a local poet, he was kind enough to recite some of his poems at our Volunteers Christmas Lunch – it was extremely well received. His latest book – The Stencil House – is now out in paperback and ebook. We are holding our AGM at 7.30pm Wednesday 15th June 2016 at our rooms in Town Close, North Road, Stokesley. Volunteers, friends and anyone who is interested in the work of the CCA are welcome.